Stockholm November 16, 2016. In 2014 Kommuninvest launched KI Finans, a web based Debt Management solution which nowadays has over 1 000 users. Kommuninvest expects similar success when going live with a pioneering solution combining Financial Assets Management with their Debt Management. The KI Finans solution provides Swedish municipalities, counties and their subsidiaries, such as housing, energy and other service companies, with powerful tools to manage their financial assets and liabilities. All relevant information related to their financial situation is processed and shown in one place, enabling a full understanding over risks, returns and the total picture of Debt and Assets combined. “We are happy to have all our financial assets and liabilities ‘under one roof’. This will put us in greater control, steering us away from external dependencies and time-consuming manual routines, and hence make time for what’s important. The solution is very user friendly, intuitive and innovative”, comments Fredrik Holst, CFO of Landstinget Västmanland as an end user of the system. The solution is delivered in cooperation of FinTech companies Finance Active and FA Solutions. The project has been finished on time and on budget, and Kommuninvest is now launching the system to municipalities and regions across Sweden. ”The debt management system supplied by Finance Active was received very well with over 1 000 users and 40 billion EUR managed in it. As our members also manage pensions, we wanted to offer them with a tool for financial asset management. Finance Active and FA Solutions have created a new innovative solution which combines multiple engines in one system with a superior user experience. We at Kommuninvest Business Development are extremely satisfied and we hope to build a bigger family of services going forward”, state Pelle Holmertz and Johan Sigge from Kommuninvest. KI Finans requires no installation and is accessible online on desktop and tablet with secure login details. 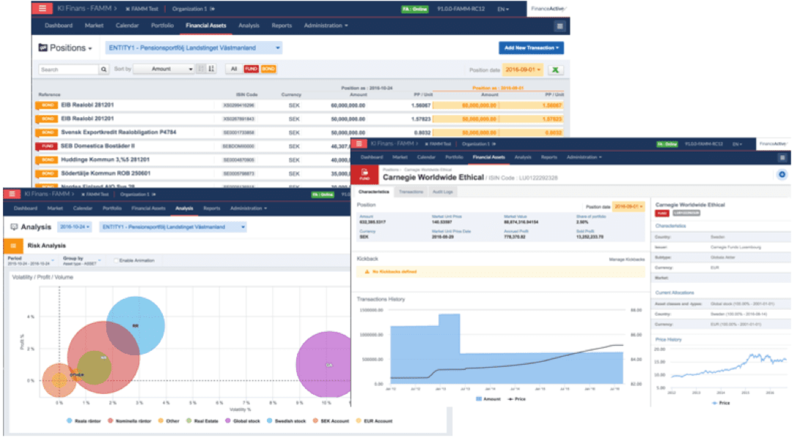 In addition to debt management KI Finans now offers global view of financial assets transactions with easy-to-use dashboards and analysis reports. Kommuninvest is a municipal cooperation for efficient and sustainable financing of housing, infrastructure, schools, hospitals etc. Together, we get better loan terms than each one individually. Since its inception in 1986, the Kommuninvest collaboration has helped lower the local government sector’s borrowing costs by many billion kronor. Currently, 275 municipalities and 11 county councils/regions are members of this voluntary cooperation. With total assets of around SEK 370 billion (USD ~42 billion), Kommuninvest is the largest lender to the local government sector and the sixth largest credit institution in Sweden. The head office is located in Örebro. More information at www.kommuninvest.se. Fintech company established in 2000 in Paris, Finance Active develops high-quality solutions to optimize debt and financial risk management: foreign exchange, investments, financial forecasting and guarantees. With over 10,000 users worldwide, Finance Active paves the way for digital transformation in financial departments of companies, local public authorities and financial institutions. Permanently connected to financial markets, our solutions provide a dynamic and centralized view that simplifies transaction management. Our innovative, user-focused approach allows us to develop agile and collaborative software to maximize financial performance and enhance operational efficiency. More information at www.financeactive.com. Founded in 1999, FA Solutions is today the leading provider of software solutions for Asset Management, Fund Management and Private Banking, with a rapid growth both in the Nordics as well as globally. FA Solutions offers modern tools for portfolio management, investment analysis, reporting, CRM and sales – everything included in one software platform which is always accessible with any device. The FA software platform is built with blocks which makes it easy to set up and tailor for customer needs but also flexible for growth. FA Solutions is a combination of high-level technical skills and strong knowledge from the finance industry. More information at www.fasolutions.com.